Is caffeine good or bad for your heart? Are there health benefits in becoming a vegetarian? What makes some fats – like the trans and saturated kinds – an unhealthy choice, while other fats are considered an essential part of healthy eating? 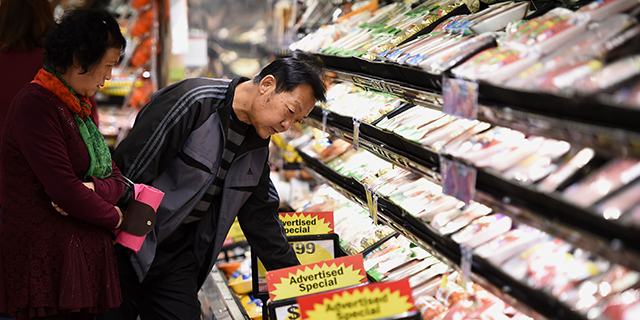 With a dizzying number of research studies and news stories about healthy eating, a key question arises: Are people able to make sense of these studies or does conflicting research lead to more confusion and even distrust? A new Pew Research Center survey asked Americans a series of questions about their exposure to news about the health effects of food and found that, while a majority of Americans at least sometimes encounter conflicting news stories about this topic, most people see it as a sign of continued progress in food science. But how Americans make sense of conflicting food studies in the news depends on their own knowledge of science. 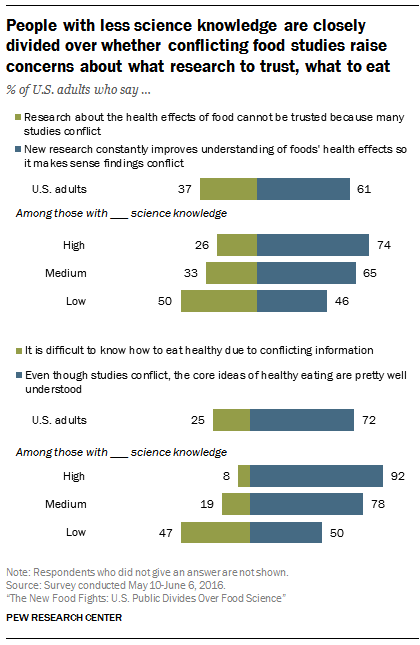 Americans with lower levels of science knowledge (based on a nine-item index) are closely divided in their views of food science studies with findings that contradict prior research. Half of those with low science knowledge say food research cannot be trusted because many studies conflict; 46% see the contradictory studies as a sign of progress in scientific understanding. By comparison, 74% of those with high science knowledge say the contradictory studies in the news make sense because new research is constantly improving understanding. While a vast majority (92%) of those with high science knowledge say they understand the core principles of healthy eating, people with low science knowledge are closely divided on this. Among those with low scientific knowledge, 50% say the core ideas of healthy eating are pretty well understood, while a similar share (47%) say it’s difficult to know what to eat because of conflicting information.